How much do camper jacks cost? For pricing information, visit our online store or call HappiJac at 1-800-231-7440. We ship through UPS, unless you request otherwise. What models of camper jacks does HappiJac make? HappiJac makes the 4160 Series Acme Camper Jack (1500 lbs), 4560 Series Ball-Screw Camper Jack (1900 lbs) and the 4800 Series Heavy Duty Acme Jack (2800 lbs). Will HappiJac jacks fit on my existing mounting brackets? If you have HappiJac brackets, they will fit any of our jacks. Each HappiJac camper jack uses the same universal Z-bracket mounting system. The strong and secure Z-bracket mounting system can be installed and/or retrofitted on most campers. Do you have a swing-out bracket for my dually truck? Yes. For dual-wheel pickup trucks, the optional swing-out bracket is easily installed and provides additional clearance needed for easy loading and unloading. Are HappiJac manual crank jacks upgradable to electric jacks? Yes. The 4160 Acme, 4560 Ball-Screw and 4800 Heavy Duty Acme jacks can easily be upgraded into a wireless remote-controlled electric jack system with the purchase and installation of a HappiJac motor kit (pn 182522) and wiring kit (pn 182524). Check all mounting screws and other hardware frequently for tightness and proper jack alignment. Wax mounting brackets and both inner and outer tubes of jack with automotive wax every 6 months. 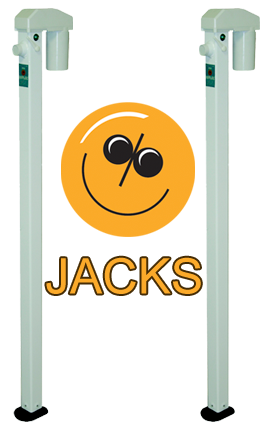 Fully extend jacks to red safety line once each year. This redistributes lubrication evenly on the screw shaft. Remove top cap and re-grease gears (if needed) with white lithium grease. Lightly oil bearings. After periods of non-use, or anytime the jack seems to labor more than usual, place a few drops of light oil (ie: 3 in 1R) into the oil hole in the crank socket, then run the jack to distribute the oil. For more than 50 years HappiJac has been producing high quality products for the RV industry. HappiJac conducts extensive research and testing to develop quality products backed by sound engineering. HappiJac has reinvented the camper jack and revolutionized the industry with the first comprehensive and fully upgradeable line of camper jacks. Click here to see our Model Comparisons. 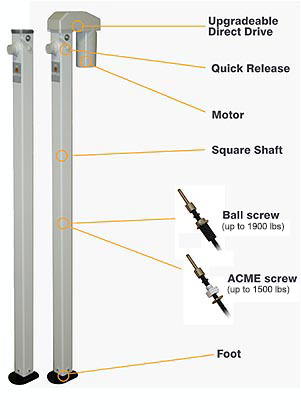 HappiJac's Acme Screw Jack is the first acme screw jack with a redundant safety check system. By providing an additional safety nut, HappiJac's Acme Screw Jack protects against mishap in the event of failure. Its unique concave (cupped) footpad reduces movement and provides greater stability than large, convex footpads. HappiJac's Acme Screw Jack features a polished steel screw and a self-lubricating, friction-reducing nut. It provides more than 34.5 inches of lift and easily and efficiently raises and lowers a camper. Each HappiJac Camper Jack features attractive 2-inch square tubing that provides significantly more strength than round tubing. The HappiJac Acme Screw Jack can lift 1500 pounds and the HappiJac Ball Screw Jack can lift 1900 pounds. Each HappiJac Camper Jack is powder coated on the inner and outer tubes to protect against rust and improve appearance. Each HappiJac camper jack uses the same universal Z-bracket mounting system. The strong and secure Z-bracket mounting system can be installed and/or retrofitted on most campers. For dual-wheel pickup trucks, the optional swing-out bracket is easily installed and provides additional clearance needed for easy loading and unloading. The Acme (4160), Ball-Screw (4560) and Heavy Duty (4800) Acme jacks can easily be upgraded into a wireless remote-controlled electric jack system with the purchase and installation of a HappiJac motor kit (pn 182522) and wiring kit (pn 182524). Below is a complete listing of Happijac camper jack installation and maintenance guides.